Derek K. Yonai, JD, Ph.D., Director of the Koch Center for Leadership & Ethics at Emporia State University, spoke to the Wichita Pachyderm Club January 11, 2019, on the topic of Teaching the Morality of Free Enterprise. View below, or click here to view at YouTube. “Overcoming obstacles can be a difficult challenge even on a level playing field. We need to change the rigged system that favors the politically connected over the hardworking, honest citizen,” writes Charles Koch in a recent edition of Perspectives. These concepts are much more than just words to me. I believe the greatest gift we can receive or pass on is the opportunity to find and pursue our passion, and, in doing so, make a difference by helping others improve their lives. It seems to me we’re now losing much of the vision our founders fought so hard to establish. Time and time again, government policies have made it tougher for people to realize their potential. This change creates some serious consequences, especially for the least-advantaged Americans, who now face more obstacles than ever in their struggle to develop and apply their unique talents and abilities. 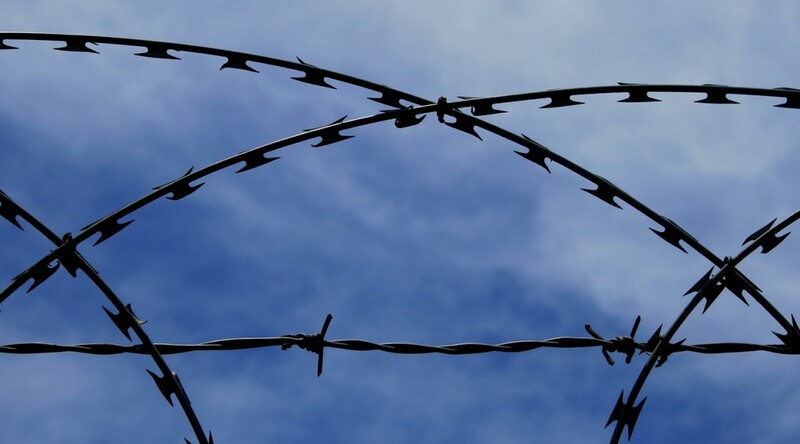 To remove these obstacles, we need to revise poverty-creating regulations and abolish corporate welfare, reform our approach to education and enact criminal justice reform. Consider the challenges of starting a small business. Most would be entrepreneurs have very little capital. To raise money, many will pledge or mortgage whatever assets they have; others will ask for a small business loan. In the past, community banks usually made such loans. But the Dodd-Frank Wall Street Reform and Consumer Protection Act, signed into law in 2010, put a particular burden on local lenders. When small borrowers have no local options, they are forced to turn to bigger banks for help, where they have even less of a chance of getting a loan. Regressive and anti-competitive regulations are also stalling progress. In particular, licensure requirements (especially at the state and local level) have become a huge obstacle. Millions are now denied jobs in more than 100 lower-income occupations because of unnecessary licensing requirements, months of mandated training and unaffordable fees. At the corporate level, excessive permitting requirements (such as a decade-long approval process for a new facility) are very anticompetitive. Such requirements not only prevent the creation of jobs, they protect existing businesses from competition and keep out new entrants, which is a form of corporate welfare. Even as the little guy is getting stiff-armed, the government has opened its arms to corporate cronyism by subsidizing big banks and corporations through the tax code, mandates, protective tariffs and so on. Too many CEOs owe their profits to government “gimmes” rather than the creation of real value by helping others improve their lives. This is the major cause of so much profit being bad rather than good (the subject of my upcoming book). Speaking of books, another troubling area is education, which should be a path for overcoming obstacles. Having an effective education that imparts the skills and values needed to make a contribution in society is essential for success. But that doesn’t mean we should try to push almost all high school graduates into a four-year liberal arts program where they may collect a lot of debt without getting any usable skills. Educational choices should reflect aptitude. Many kids with mechanical aptitudes will be much more successful by learning a skilled trade or craft. America should be a place that encourages and enables people to find opportunities to contribute and succeed, and have meaning and fulfillment in their lives. Instead, it appears that America has become a two-tiered system, in which those with political connections get favors while obstacles are placed in front of those who are left behind. A great nation does not treat people according to some group classification, whether it be race, religion, gender or age, instead of on their individual merits. We need to reform our legal and regulatory system so that it treats everyone equally and doesn’t discriminate against the least-advantaged in our society. Overcoming obstacles can be a difficult challenge even on a level playing field. We need to change the rigged system that favors the politically connected over the hardworking, honest citizen. If local governments don’t fund arts, we risk a Soviet-style existence. This line of thought is precisely backwards. 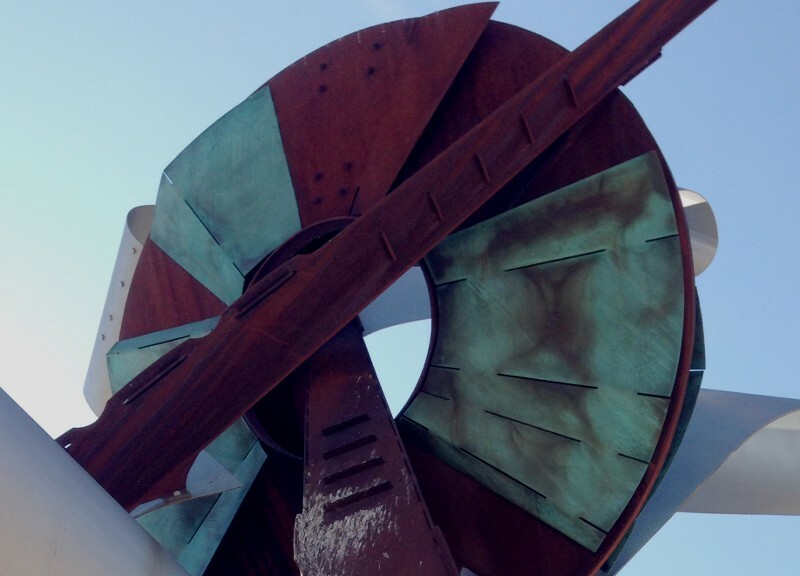 The Wichita Arts Council receives approximately $14,000 from the county, which it uses to provide seed money for start-up art projects, president Arlen Hamilton said. It also receives about $6,000 from the city, he said. This line of reasoning is precisely backwards. When government taxes us and turns over the funds to a group of elitists to make decisions about which art is desirable and which is not, that is characteristic of totalitarian, socialist societies. In a civil society people don’t expect others to be forced to pay for things like this. Defenders of arts funding seem blithely unaware of this danger when they praise the role of the national endowments as an imprimatur or seal of approval on artists and arts groups. Jane Alexander says, “The Federal role is small but very vital. We are a stimulus for leveraging state, local and private money. We are a linchpin for the puzzle of arts funding, a remarkably efficient way of stimulating private money.” Drama critic Robert Brustein asks, “How could the [National Endowment for the Arts] be ‘privatized’ and still retain its purpose as a funding agency functioning as a stamp of approval for deserving art?” … I suggest that that is just the kind of power no government in a free society should have. The leveraging effect of seed money means that elitists like the members of the Wichita Arts Council have great power in deciding who will succeed in the arts in Wichita. We give up a lot when we turn over this power to government bureaucrats and arts commission cronies. Contrary to the argument of the Arts Council president, arts thrive in markets where people are free to choose, and stagnate under taxation and bureaucracy. 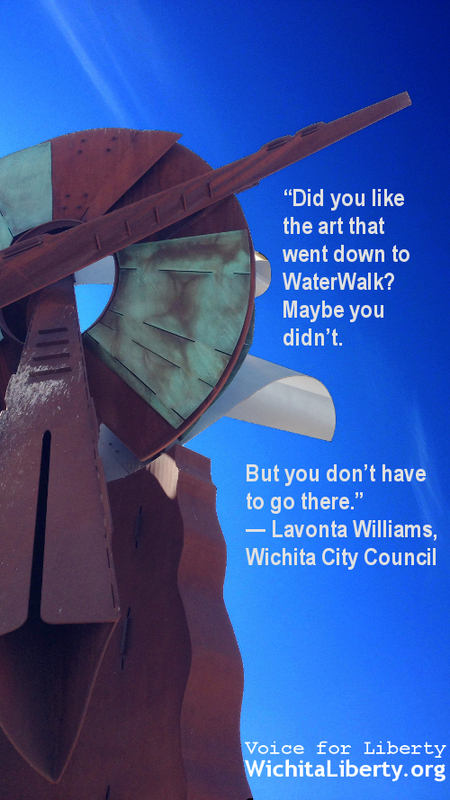 The attitude of Wichita elected officials regarding art: If you don’t like this statue, just don’t go there, says Wichita City Council member Lavonta Williams. But, you still must pay for it. Koch Industries was the only major producer in the ethanol industry to argue for the demise of the ethanol tax credit in 2011. That government handout (which cost taxpayers billions) needlessly drove up food and fuel prices as well as other costs for consumers — many of whom were poor or otherwise disadvantaged. Now the mandate needs to go, so that consumers and the marketplace are the ones who decide the future of ethanol. 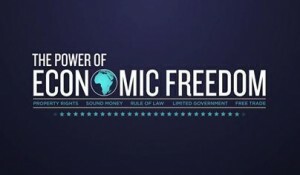 Learn how economic freedom creates prosperity and improves lives throughout the world. Walter Williams, as he often does, explains the core of the problem using his characteristically blunt imagery: “Once legalized theft begins, it pays for everybody to participate.” Williams says not only does it pay to participate, the reality is that it is often necessary to participate in order to stay in business. This is part of the treacherous nature of government interventionism: A business can be humming along, earning a profit by meeting the needs of its customers, when government radically alters the landscape. Perhaps government backs a competitor, or forces changes to business methods that have been working satisfactorily and harming no one. What is the existing business to do in response? Consent to be driven out of business, just to prove a point? Existing firms, then, are usually compelled to participate in the government program — accepting subsidies, conforming to mandates, letting government pull the strings. This creates an environment where government intervention spirals, growing by feeding on itself. It’s what we have today. In Kansas, there are state income tax credit programs that award credits (economically equivalent to cash payments) to companies that meet certain requirements that were established by the legislature and are administered by bureaucrats. These corporate welfare programs, which represent cronyism, are more valuable than lower tax rates, at least to influential Kansas businesses. I have devoted most of my life to understanding the principles that enable people to improve their lives. It is those principles — the principles of a free society — that have shaped my life, my family, our company and America itself. Continue reading at Wall Street Journal (subscription not required). More about Koch Industries, including an interview with Charles Koch that covers some of these topics, is available in a recent issue of Wichita Business Journal. Click here for free access. Economic freedom, in countries where it is allowed to thrive, leads to better lives for people as measured in a variety of ways. This is true for everyone, especially for poor people. This is the message presented in a short video based on the work of the Economic Freedom of the World report, which is a project of Canada’s Fraser Institute. Four years ago Robert Lawson, one of the authors of the Economic Freedom of the World report, lectured in Wichita on this topic. The current video is made possible by the Charles G. Koch Charitable Foundation. One of the findings highlighted in the presentation is that while the average income in free countries is much higher than that in the least-free countries, the ratio is even higher for the poorest people in these countries. This is consistent with the findings that economic freedom is good for everyone, and even more so for those with low incomes. Civil rights, a clean environment, long life expectancy, low levels of corruption, less infant mortality, less child labor, and lower unemployment are all associated with greater levels of economic freedom. Property rights are protected under an impartial rule of law. People are free to trade with others, both within and outside the country. There is a sound national currency, so that peoples’ money keeps its value. Government stays small, relative to the size of the economy. Economic freedom is not necessarily the platform of any single political party. It should be noted that for about eight of the past twelve years — a period in which our economic freedom has been falling — there was a Republican president, sometimes with a Republican Congress. The size of government rose. In 2005 the Cato Institute studied the numbers and found that “All presidents presided over net increases in spending overall, though some were bigger spenders than others. As it turns out, George W. Bush is one of the biggest spenders of them all. In fact, he is an even bigger spender than Lyndon B. Johnson in terms of discretionary spending.” This was before the spending on the prescription drug program had started. The defining of what economic freedom means is important. Sometimes you’ll see people write things like “Bernie Madoff was only exercising his personal economic freedom while he ran his investment firm.” Madoff, we now know, was a thief. He stole his clients’ money. That’s contrary to property rights, and therefore contrary to economic freedom. Or, you’ll see people say if you don’t like government, go to Somalia. That country, one of the poorest in the world — but not the poorest — is used as an example of how bad anarchy is as a form of government. The evidence is, however, that Somalia’s former government was so bad that things improved after the fall of that government. See Peter T. Leeson, Better Off Stateless: Somalia Before and After Government Collapse and History of Somalia (1991–2006). You’ll also encounter people who argue that some countries are poor because they have no natural resources. But there are many countries with few natural resources that have economic freedom and a high standard of living. Most countries that are poor are that way because they are run by corrupt governments that have no respect for economic freedom, and follow policies that stifle it. Some will argue that economic freedom means the freedom to pollute the environment. But it is in wealthy countries that the environment is respected. Poor countries, where people are struggling just to find food for each day, don’t have the time or wealth to be concerned about the environment. From September 2012, and even more relevant today. The editorial in today’s Wall Street Journal by Charles G. Koch, chairman of the board and CEO of Wichita-based Koch Industries contains many powerful arguments against the rise of cronyism. The argument above is just one of many. The entire article is available at the Wall Street Journal. Koch has also contributed other articles on this topic, see Charles G. Koch: Why Koch Industries is speaking out and Charles Koch: The importance of economic freedom. Businesses have failed to make the case that government policy — not business greed — has caused many of our current problems. To understand the dreadful condition of our economy, look no further than mandates such as the Fannie Mae and Freddie Mac “affordable housing” quotas, directives such as the Community Reinvestment Act, and the Federal Reserve’s artificial, below-market interest-rate policy. Far too many businesses have been all too eager to lobby for maintaining and increasing subsidies and mandates paid by taxpayers and consumers. This growing partnership between business and government is a destructive force, undermining not just our economy and our political system, but the very foundations of our culture. With partisan rhetoric on the rise this election season, it’s important to remind ourselves of what the role of business in a free society really is — and even more important, what it is not. This is the message presented in a short video based on the work of the Economic Freedom of the World report, which is a project of Canada’s Fraser Institute. Two years ago Robert Lawson, one of the authors of the Economic Freedom of the World report, lectured in Wichita on this topic. The current video is made possible by the Charles G. Koch Charitable Foundation. At a recent educational meeting I attended, someone asked the question: Why doesn’t everyone believe what we (most of the people attending) believe: that private property and free exchange — capitalism, in other words — are superior to government intervention and control over the economy? It’s question that I’ve asked at conferences I’ve attended. The most hopeful answer is ignorance. While that may seem a harsh word to use, ignorance is simply a “state of being uninformed.” That can be cured by education. This is the reason for this website. This is the reason why I and others testify in favor of free markets and against government intervention. It is the reason why John Todd gives out hundreds of copies of I, Pencil, purchased at his own expense. There it is: Planners and regulators. We have plenty of these at all levels of government, and these are prime examples of the intellectual class. Is it any wonder that the locus of centralized planning in south-central Kansas — sustainable communities — is at a government university? One of the ways that the new statist intellectuals did their work was to change the meaning of old labels, and therefore to manipulate in the minds of the public the emotional connotations attached to such labels. For example, the laissez-faire libertarians had long been known as “liberals,” and the purest and most militant of them as “radicals”; they had also been known as “progressives” because they were the ones in tune with industrial progress, the spread of liberty, and the rise in living standards of consumers. The new breed of statist academics and intellectuals appropriated to themselves the words “liberal” and “progressive,” and successfully managed to tar their laissez- faire opponents with the charge of being old-fashioned, “Neanderthal,” and “reactionary.” Even the name “conservative” was pinned on the classical liberals. And, as we have seen, the new statists were able to appropriate the concept of “reason” as well. Throughout the ages, the emperor has had a series of pseudo-clothes provided for him by the nation’s intellectual caste. In past centuries, the intellectuals informed the public that the State or its rulers were divine, or at least clothed in divine authority, and therefore what might look to the naive and untutored eye as despotism, mass murder, and theft on a grand scale was only the divine working its benign and mysterious ways in the body politic. In recent decades, as the divine sanction has worn a bit threadbare, the emperor’s “court intellectuals” have spun ever more sophisticated apologia: informing the public that what the government does is for the “common good” and the “public welfare,” that the process of taxation-and-spending works through the mysterious process of the “multiplier” to keep the economy on an even keel, and that, in any case, a wide variety of governmental “services” could not possibly be performed by citizens acting voluntarily on the market or in society. All of this the libertarian denies: he sees the various apologia as fraudulent means of obtaining public support for the State’s rule, and he insists that whatever services the government actually performs could be supplied far more efficiently and far more morally by private and cooperative enterprise. The libertarian therefore considers one of his prime educational tasks is to spread the demystification and desanctification of the State among its hapless subjects. His task is to demonstrate repeatedly and in depth that not only the emperor but even the “democratic” State has no clothes; that all governments subsist by exploitive rule over the public; and that such rule is the reverse of objective necessity. He strives to show that the very existence of taxation and the State necessarily sets up a class division between the exploiting rulers and the exploited ruled. He seeks to show that the task of the court intellectuals who have always supported the State has ever been to weave mystification in order to induce the public to accept State rule, and that these intellectuals obtain, in return, a share in the power and pelf extracted by the rulers from their deluded subjects. The alliance is based on a quid pro quo: on the one hand, the intellectuals spread among the masses the idea that the State and its rulers are wise, good, sometimes divine, and at the very least inevitable and better than any conceivable alternatives. In return for this panoply of ideology, the State incorporates the intellectuals as part of the ruling elite, granting them power, status, prestige, and material security. Furthermore, intellectuals are needed to staff the bureaucracy and to “plan” the economy and society. The “material security,” measured in dollars, can be pretty good, as shown by these examples: The Wichita city manager is paid $185,000, the Sedgwick county manager is paid $175,095, and the superintendent of the Wichita school district is paid $224,910. An editorial in Wall Street Journal last year written by Charles G. Koch, chairman of the board and CEO of Wichita-based Koch Industries contains many powerful arguments against the rise of cronyism. The argument above is just one of many. Trouble begins whenever businesses take their eyes off the needs and wants of consumers—and instead cast longing glances on government and the favors it can bestow. When currying favor with Washington is seen as a much easier way to make money, businesses inevitably begin to compete with rivals in securing government largess, rather than in winning customers. … There are now businesses and entire industries that exist solely as a result of federal patronage. Profiting from government instead of earning profits in the economy, such businesses can continue to succeed even if they are squandering resources and making products that people wouldn’t ordinarily buy. The role of business is to provide products and services that make people’s lives better — while using fewer resources — and to act lawfully and with integrity. Businesses that do this through voluntary exchanges not only benefit through increased profits, they bring better and more competitively priced goods and services to market. This creates a win-win situation for customers and companies alike. Only societies with a system of economic freedom create widespread prosperity. Studies show that the poorest people in the most-free societies are 10 times better off than the poorest in the least-free. Free societies also bring about greatly improved outcomes in life expectancy, literacy, health, the environment and other important dimensions. So far one video advertisement is available, shown at the end of this article. Koch is not shying away from important issues related to economic freedom such as the minimum wage. The common belief, fiercely held and believed by those who say they want to help the poor, is that a high minimum wage is needed. In a video on another site sponsored by the Charles Koch foundation, it is argued that “And among the least skilled, least educated workers, increases in the minimum wage significantly increase unemployment. The minimum wage may be a well-intentioned policy, but it often hurts the very workers who are in most need of our help.” The video is Does the minimum wage hurt workers? at the site Economic Freedom. 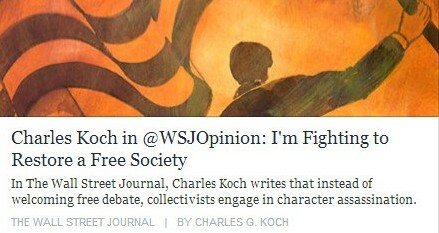 Recently Koch has contributed several articles on the importance of economic freedom and the harm of cronyism, including Charles Koch: The importance of economic freedom, and in the Wall Street Journal, Charles G. Koch: Why Koch Industries is speaking out. To help Kansans understand how legislators vote, Kansas Policy Institute has produced the Kansas Freedom Index for 2013. Legislative scorecards like this are important as they let citizens know how legislators have actually voted, which is sometimes different from their campaign rhetoric, and even different from their current proclamations. Generally, scorecards include a large sampling of votes, so that no single issue paints a member into a corner. [powerpress url=”https://wichitaliberty.org/wp-content/uploads/2013/05/james-franko-kansas-policy-institute-joseph-ashby-show-2013-05-17-excerpt.mp3″]James Franko of Kansas Policy Institute joins Bob Weeks on the Joseph Ashby Show to discuss the Kansas Freedom Index. Then, Bob runs down the scores for Wichita-area legislators. The Kansas Freedom Index, as produced by KPI this year, is important and significant because it focuses on issues of economic freedom along with education freedom, which was added this year. So far, 45 bills have been included in the scorecard, and as the legislature is still in session and has at least two important bills to pass, there may be additions to the scorecard. 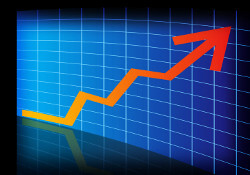 This year’s index is a continuation of the construction of indexes for past years, many of which may be found at Kansas Economic Freedom Index. For more about Friedman and his thoughts on economic freedom, see Milton Friedman, the Father of Economic Freedom. If you spot government waste and you have an iPhone, you can make a difference. There’s now an app for that. Bankrupting America is, according to its website, “an educational project that explores the policies hindering economic opportunity and growth in America. The project focuses on the causes of the country’s current economic downturn and the future implications of careless policy-making.” It’s produced many informative videos and infographics, many which I’ve shared here or on Quick Takes. Now, Bankrupting America has a free app for your iPhone. Besides providing a convenient way to read Bankrupting America’s content and view videos, it’s also a way to report government waste. That’s what I did last week. 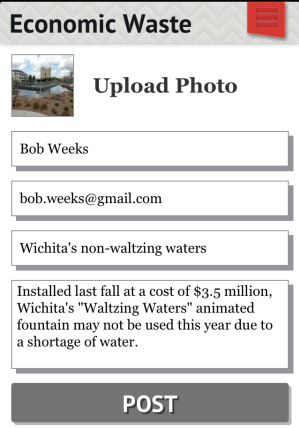 Readers in Wichita may be aware that the city may not open the “Waltzing Waters” fountain this year, citing the water shortage. This compounds the waste of the purchase of the fountain and the building of its stage with its non-use. Using my iPhone to submit a tip concerning government waste to Bankrupting America. So when I was near downtown Wichita I used the Bankrupting America app to take a picture and submit my tip. It was easy to do, and resulted in this article on Bankrupting America. Note that the editors at BA took my tip as just that — a starting point. They then did their own research to write the article. 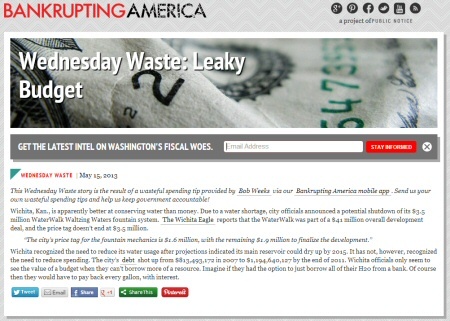 Initiatives like this are helpful in keeping a watchful eye on government spending and waste. The city will freely and liberally spend taxpayer funds promoting the goodness of the Waltzing Waters and everything else City Hall does. Local newspapers, television, and radio may report on waste, but this legacy media can’t report on everything that needs highlighting. Citizens like yourself can now step up and fill in the gap. The resulting article at Bankrupting America. Once again, the Wichita Eagle editorial board misses the point regarding downtown Wichita development. There may be some that are opposed to downtown simply because it’s downtown, or for other silly reasons. That seems to be the focus of Rhonda Holman’s editorial today. But speaking from a perspective of economic freedom and individual liberty, it’s government interventionism in downtown that I object to. This is what harms Wichita, not the fact that people are living and working downtown or anywhere else, for that matter. The political cronyism involved in many projects in downtown Wichita is what harms our city. When government takes from one and gives to another, everyone is worse off — other than the recipients. I understand that it’s easy to look at a subsidized project — be it downtown or elsewhere — and see people working at jobs. It’s much more difficult, however, to see the harm that the government intervention causes: Prosperity and jobs are lost due to inefficient government allocation of capital through political, not market, mechanisms. In the whole, we are worse off, not better. If you don’t believe this — if you insist that the city government can create jobs and prosperity through its interventions, and that these have no net cost — then you have to ask why the city is not involved in more development. It is the principled objection to government involvement that many do not understand, including, I think, the Wichita Eagle editorial board. An example: In September 2011, after I and others started a campaign to overturn a city council decision to award a tax subsidy to the Ambassador Hotel, the hotel’s lead developer asked to meet with me. In the meeting I explained that I would oppose the city’s action if applied to any hotel, located anywhere in Wichita, owned by anyone. He said that he sensed my opposition was based on principle, and I agreed. The curious thing is that this seemed to puzzle him — that people would actually apply principles to politics. The political allocation of investment capital in Wichita leads to problems of the appearance of impropriety, if not actual impropriety. There is a small group of people that repeatedly receive large amounts of taxpayer subsidy. These people and others associated with their companies regularly contribute to the campaign funds of city council members and candidates. These council members then vote to grant these people taxpayer-funded subsidy, year after year. City council members also vote to award them with no-bid contracts. That’s terrible government policy. Especially when one recent contract was later put to competitive bid, and turned out to cost much less than the no-bid price. City council members, all except one, were willing to award their significant campaign contributors with an overpriced no-bid contract at taxpayer expense. The company that won the no-bid contract was Key Construction. Its owners and executives were the sole contributors to the campaign fund of Lavonta Williams (district 1, northeast Wichita) in 2012 as she prepared to run for reelection this spring. James Clendenin (district 3, southeast and south Wichita), also running for reelection this spring, and also having voted for the no-bid contract for Key, also received many contributions from Key and its executives in 2012. That company, along with person associated with one other company, were the sole source of Clendenin’s campaign funding that year. Doesn’t the Wichita Eagle editorial board see a problem here? Doesn’t the newsroom? There was a time when newspaper opinion editors crusaded against this type of behavior. Newspaper editorial writers ought also to be concerned about how taxpayer funds are spent. The City of Wichita, however, has established non-profit organizations to spend taxpayer funds. The Wichita Downtown Development Corporation, for example, is funded almost exclusively through taxes. Yet, it claims that it is not a public agency as defined in the Kansas Open Records Act, and therefore need not fulfill records requests seeking to bring transparency as to how the agency spends its taxpayer funds. The city, inexplicably, backs WDDC in this interpretation of law that is contrary to the interests of citizens. Secrecy of this type regarding taxpayer funds is not good public policy. There was a time when newspaper editors railed against government secrecy like this. We need a newspaper editorial board that understands principle vs. political expediency. As a first step, let’s ask for an editorial board that recognizes these abuses of citizens and is willing to talk about them. Critics of the economic development policies in use by the City of Wichita are often portrayed as not being able to see and appreciate the good things these policies are producing, even though they are unfolding right before our very eyes. The difference is that some look beyond the immediate — what is seen — and ask “And then what will happen?” — looking for the unseen. When we are talking about applied economic policies, we are no longer talking about pure economic principles, but about the interactions of politics and economics. 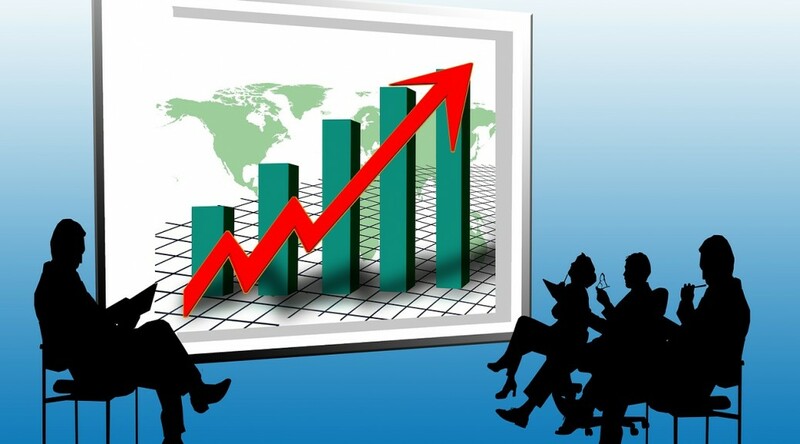 The principles of economics remain the same, but the likelihood of those principles being applied unchanged is considerably reduced, because politics has its own principles and imperatives. It is not just that politicians’ top priority is getting elected and re-elected, or that their time horizon seldom extends beyond the next election. The general public as well behaves differently when making political decisions rather than economic decisions. Virtually no one puts as much time and close attention into deciding whether to vote for one candidate rather than another as is usually put into deciding whether to buy one house rather than another — or perhaps even one car rather than another. The voter’s political decisions involve having a minute influence on policies which affect many other people, while economic decision-making is about having a major effect on one’s own personal well-being. It should not be surprising that the quantity and quality of thinking going into these very different kinds of decisions differ correspondingly. One of the ways in which these decisions differ is in not thinking through political decisions beyond the immediate consequences. When most voters do not think beyond stage one, many elected officials have no incentive to weigh what the consequences will be in later stages — and considerable incentives to avoid getting beyond what their constituents think and understand, for fear that rival politicians can drive a wedge between them and their constituents by catering to public misconceptions. The economic decisions made by governing bodies like the Wichita City Council have a large impact on the lives of Wichitans. But as Sowell explains, these decisions are made by politicians for political reasons. When I was an undergraduate studying economics under Professor Arthur Smithies of Harvard, he asked me in class one day what policy I favored on a particular issue of the times. Since I had strong feelings on that issue, I proceeded to answer him with enthusiasm, explaining what beneficial consequences I expected from the policy I advocated. “And then what will happen?” he asked. The question caught me off guard. However, as I thought about it, it became clear that the situation I described would lead to other economic consequences, which I then began to consider and to spell out. “And what will happen after that?” Professor Smithies asked. As I analyzed how the further economic reactions to the policy would unfold, I began to realize that these reactions would lead to consequences much less desirable than those at the first stage, and I began to waver somewhat. “And then what will happen?” Smithies persisted. By now I was beginning to see that the economic reverberations of the policy I advocated were likely to be pretty disastrous — and, in fact, much worse than the initial situation that it was designed to improve. Simple as this little exercise may sound, it goes further than most economic discussions about policies on a wide range of issues. Most thinking stops at stage one. These questions, and the answers to them, are examples of stage one thinking. The answers are easily obtained and cited as evidence of the success of the government program. But driving by a store or hotel in a TIF district and noticing a building or people working at jobs does not tell the entire story. Using the existence of a building, or the payment of taxes, or jobs created, is stage one thinking, and no more than that. Fortunately, there are people who have thought beyond stage one, and some concerning local economic development and TIF districts. 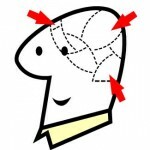 And what they’ve found should spur politicians and bureaucrats to find ways to move beyond stage one in their thinking. TIF districts grow much faster than other areas in their host municipalities. TIF boosters or naive analysts might point to this as evidence of the success of tax increment financing, but they would be wrong. Observing high growth in an area targeted for development is unremarkable. If the use of tax increment financing stimulates economic development, there should be a positive relationship between TIF adoption and overall growth in municipalities. This did not occur. If, on the other hand, TIF merely moves capital around within a municipality, there should be no relationship between TIF adoption and growth. What we find, however, is a negative relationship. Municipalities that use TIF do worse. We find evidence that the non-TIF areas of municipalities that use TIF grow no more rapidly, and perhaps more slowly, than similar municipalities that do not use TIF. 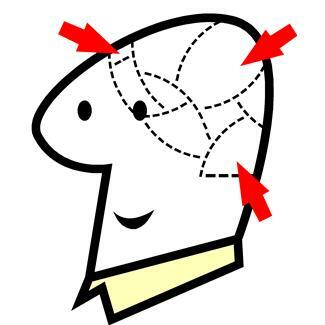 Here we have an example of thinking beyond stage one. The results are opposite of what one-stage thinking produces. Increasingly, municipal leaders justify their use of tax increment financing (TIF) by touting its role in improving municipal employment. However, empirical studies on TIF have primarily examined TIF’s impact on property values, ignoring the claim that serves as the primary justification for its use. This article addresses the claim by examining the impact of TIF adoption on municipal employment growth in Illinois, looking for both general impact and impact specific to the type of development supported. Results find no general impact of TIF use on employment. However, findings suggest that TIF districts supporting industrial development may have a positive effect on municipal employment, whereas TIF districts supporting retail development have a negative effect on municipal employment. These results are consistent with industrial TIF districts capturing employment that would have otherwise occurred outside of the adopting municipality and retail TIF districts shifting employment within the municipality to more labor-efficient retailers within the TIF district. While this research might be used to support a TIF district for industrial development, TIF in Wichita is primarily used for retail development. And, when thinking beyond stage one, the effect on employment — considering the entire city — is negative. It’s hard to think beyond stage one. It requires considering not only the seen, but also the unseen, as Frederic Bastiat taught us in his famous parable of the broken window. But over and over we see how politicians at all levels of government stop thinking at stage one. This is one of the many reasons why we need to return as much decision-making as possible to the private sector, and drastically limit the powers of politicians and governments. When the New York Times is concerned about the cost of government spending programs, it’s a safe bet that things are really out of control. Its recent feature As Companies Seek Tax Deals, Governments Pay High Price reports on economic development incentive programs that are costly and produce questionable benefits. Kansas Governor Sam Brownback appears in a video that accompanies the story. Today, many governments give special treatment to a favored few businesses that eagerly accept those favors. This is the essence of cronyism. Many businesses with unpopular products or inefficient production find it much easier to curry the favor of a few influential politicians or a government agency than to compete in the open market. After all, the government can literally guarantee customers and profitability by mandating the use of certain products, subsidizing production or providing protection from more efficient competitors. Cronyism enables favored companies to reap huge financial rewards, leaving the rest of us — customers and competitors alike — worse off. But the Chamber recommends retaining several business welfare programs that are harmful to capitalism and economic freedom. ISSUE: Existing economic development tools are essential for the continued growth and prosperity of our community. RECOMMEND: The Wichita City Council supports continuation of its 2012 legislative agenda item, calling for protection of existing economic development tools for local public-private partnerships. Among those are Tax Increment Financing (TIF) districts, Community Improvement Districts (CIDs), Industrial Revenue Bonds (IRBs) and Sales Tax Revenue (STAR) bonds. Nancy Pfotenhauer of Koch Industries explains that when big government politicians say “Koch,” they’re not talking about the successful American company that employs more than 50,000 people nationwide. They’re really attacking the principles of economic freedom that Koch has advocated for more than 50 years regardless of what political party holds power. But with all the pressing issues challenging our nation, shouldn’t the big government advocates in Washington be talking about something else besides us? Why is economic freedom so important, and important to everyone? The following video explains in just one minute. Unfortunately, people in the United States have less economic freedom than before. For more about economic freedom and its important, I recommend The importance of economic freedom and Advancing economic freedom. We often see criticism of politicians for sensing “which way the wind blows,” that is, shifting their policies to pander to the prevailing interests of important special interest groups. The associated negative connotation is that politicians do this without regard to whether these policies are wise and beneficial for everyone. So when a Member of Congress takes a position that is literally going against the wind in the home district and state, we ought to take notice. Someone has some strong convictions. The issue is the production tax credit (PTC) paid to wind power companies. For each kilowatt-hour of electricity produced, the United States government pays 2.2 cents. Wind power advocates contend the PTC is necessary for wind to compete with other forms of electricity generation. Without the PTC, it is said that no new wind farms would be built. The PTC is an important issue in Kansas not only because of the many wind farms located there, but also because of wind power equipment manufacturers that have located in Kansas. An example is Siemens. That company, lured by millions in local incentives, built a plant in Hutchinson. Employment was around 400. But now the PTC is set to expire on December 31, and it’s uncertain whether Congress will extend the program. As a result, Siemens has laid off employees. Soon only 152 will be at work in Hutchinson, and similar reductions in employment have happened at other Siemens wind power equipment plants. Rep. Pompeo is opposed to all tax credits for energy production, and has authored legislation to eliminate them. As the wind PTC is the largest energy tax credit program, Pompeo and others have written extensively of the market distortions and resultant economic harm caused by the PTC. A recent example is Puff, the Magic Drag on the Economy: Time to let the pernicious production tax credit for wind power blow away, which appeared in the Wall Street Journal. The special interests that benefit from the PTC are striking back. An example comes from Dave Kerr, who as former president of the Hutchinson/Reno County Chamber of Commerce played a role in luring Siemens to Hutchinson. Kerr’s recent op-ed in the Hutchinson News is notable not only for its several attempts to deflect attention away from the true nature of the PTC, but for its personal attacks on Pompeo. There’s no doubt that the Hutchinson economy was dealt a setback with the announcement of layoffs at the Siemens plant that manufactures wind power equipment. Considered in a vacuum, these jobs were good for Hutchinson. But we shouldn’t make our nation’s policy in a vacuum, that is, bowing to the needs of special interest groups — sensing “which way the wind blows.” When considering everything and everyone, the PTC paid to producers of power generated from wind is a bad policy. We ought to respect Pompeo for taking a principled stand on this issue, instead of pandering to the folks back home. Kerr is right about one claim made in his op-ed: The PTC for wind power is not quite like the Solyndra debacle. Solyndra received a loan from the Federal Financing Bank, part of the Treasury Department. Had Solyndra been successful as a company, it would likely have paid back the government loan. This is not to say that these loans are a good thing, but there was the possibility that the money would have been repaid. But with the PTC, taxpayers spend with nothing to show in return except for expensive electricity. And spend taxpayers do. Kerr, in an attempt to distinguish the PTC from wasteful government spending programs, writes the PTC is “actually an income tax credit.” The use of the adverb “actually” is supposed to alert readers that they’re about to be told the truth. But truth is not forthcoming from Kerr — there’s no difference. Tax credits are government spending. They have the same economic effect as “regular” government spending. To the company that receives them, they can be used — just like cash — to pay their tax bill. Or, the company can sell them to others for cash, although usually at a discounted value. From government’s perspective, tax credits reduce revenue by the amount of credits issued. Instead of receiving tax payments in cash, government receives payments in the form of tax credits — which are slips of paper it created at no cost and which have no value to government. Created, by the way, outside the usual appropriations process. That’s the beauty of tax credits for big-government spenders: Once the program is created, money is spent without the burden of passing legislation. If we needed any more evidence that PTC payments are just like cash grants: As part of Obama’s ARRA stimulus bill, for tax years 2009 and 2010, there was in effect a temporary option to take the federal PTC as a cash grant. The paper PTC, ITC, or Cash Grant? An Analysis of the Choice Facing Renewable Power Projects in the United States explains. In western Texas since 2008, wind power generators paid the electrical grid to take their electricity ten percent of the hours of each day. Once we recognize that tax credits are the same as government spending, we can see the error in Kerr’s argument that if the PTC is ended, it is the same as “a tax increase on utilities, which, because they are regulated, will pass on to consumers.” Well, government passes along the cost of the PTC to taxpayers, illustrating that there really is no free lunch. Kerr attacks Pompeo for failing to “crusade” against two subsidies that some oil companies receive: Intangible Drilling Costs and the Percentage Depletion Allowance. These programs are deductions, not credits. They do provide an economic benefit to the oil companies that can use them (“big oil” can’t use percentage depletion at all), but not to the extent that tax credits do. Kerr wants to deflect attention away from the cost and harm of the PTC. Haranguing Pompeo for failing to attack percentage depletion and IDC with the same fervor as tax credits is only an attempt to muddy the waters so we can’t see what’s happening right in front of us. It’s not, as Kerr alleges, “playing Clintonesque games of semantics with us.” As we’ve seen, Pompeo has called for the end of these two tax deductions. If we want to criticize anyone for inconsistency, try this: Kerr criticizes Pompeo for ignoring the oil and gas deductions, “which creates a glut in natural gas that drives down the price to the lowest levels in a decade.” These low energy prices should be a blessing to our economy. Kerr, however, demands taxpayers pay to subsidize expensive wind power so that it can compete with inexpensive gas. In the end, the benefit of inexpensive gas is canceled. Who benefits from that, except for the wind power industry? The oil and gas targeted deductions also create market distortions, and therefore should be eliminated. But at least they work to reduce prices, not increase them. By the way, Pompeo has been busy with legislation targeted at ending other harmful subsidies: H.R. 3090: EDA Elimination Act of 2011, H.R. 3994: Grant Return for Deficit Reduction Act, H.R. 3308: Energy Freedom and Economic Prosperity Act, and the above-mentioned resolution. I did notice, however, that Pompeo hasn’t called for the end to the mohair subsidy. Will Kerr attack him for this oversight? Finally, Kerr invokes the usual argument of government spenders: Cut the budget somewhere else. That’s what everyone says. Creating entire industries that exist only by being propped up by government subsidy means that we all pay more to support special interest groups. A prosperous future is best built by relying on free enterprise and free markets in energy, not on programs motivated by the wants of politicians and special interests. Kerr’s attacks on Pompeo illustrate how difficult it is to replace cronyism with economic freedom. Are those who call for an end to government subsidy programs hypocrites for accepting those same subsidies? This is a common criticism, said to undermine the argument for ending government subsidy programs. Rather, the existence of this debate is evidence of the growing pervasiveness of government involvement not only in business, but in our personal lives as well. Walter Williams, as he often does, recognizes the core of the problem: “Once legalized theft begins, it pays for everybody to participate.” The swelling ranks of bureaucrats preside over this. So should people who have built businesses — large or small — sit idle as government props up a competitor that could put them out of business? While Williams says not only does it pay to participate, the reality is that it is often necessary to participate in order to stay in business. This is part of the insidious nature of government interventionism: A business can be humming along, earning a profit by meeting the needs of its customers, when a government-backed competitor enters the market. What is the existing business to do? Consent to be driven out of business, just to prove a point? So existing firms are often compelled to participate in the government program, accepting not only subsidy but the strings that accompany. This creates an environment where government intervention spirals, feeding on itself. It’s what we have today. Not only does this happen in business, it also happens in personal life. I am opposed to the existence of the Social Security Administration and being forced to participate in a government retirement plan. Will I, then, forgo my social security payments when I become eligible to receive them? If the government hadn’t been taking a large share of my earnings for many years, I’d be in a better position to provide for my own retirement. So as a practical matter, many people need their benefits, and rightly are entitled to them as a way to get back at least some of what they paid. The harmful effect is that government, by taking away some of our capacity — and reducing the initiative — to save for ourselves, creates more dependents. Often those who advocate for reduced government spending are criticized when they may be awarded government contracts. But if the contracts are awarded competitively and not based on cronyism, the winning company is saving taxpayer money by providing products or services inexpensively. This is true even when the government spending is ill-advised or wasteful: If government is going to waste money, it should waste it efficiently, I suppose. Kevin Horrigan’s commentary was misleading and a disservice to readers (“GOP acts as bellhop for corporations, Kochs,” Sept. 21 Opinion). Yes, Koch Industries benefits from subsidies — a fact Charles Koch stated in his Wall Street Journal commentary. This is not hypocrisy, as Horrigan claimed. Rather, where subsidies exist, any company that opts out will be at a disadvantage and often driven out of business by competitors with the artificial advantage. This perverse incentive drives out companies that are in favor of sound fiscal policy and opposed to subsidies, and favors inefficient companies that are dependent on subsidies. Koch’s long-standing position is to end to all subsidies, which distort the market and ultimately cost taxpayers billions of dollars. Horrigan faulted Koch for not mentioning the company’s lawful contributions to “conservative politicians and causes.” Charles Koch has publicly advocated for and supported free-market causes for decades. This is a First Amendment right that people and groups across the political spectrum also exercise. The columnist falsely claimed that Koch has funded anti-labor organizations. About 15,000 of our 50,000 U.S employees are represented by labor unions. We have long-standing, mutually beneficial relationships with these unions. In this time when far too few speak up for economic freedom, Charles Koch challenges out-of-control government spending and rampant cronyism that undermines our economy, political system and culture. For this, he should be lauded, not vilified.